The Bochumer Verein Verkehrstechnik GmbH makes every effort to ensure that the content on this website is up-to-date, complete and correct. All subject matter on these pages is carefully checked during compilation and at irregular intervals thereafter. However, since information can change very quickly, the content may not always be up-to-date, accurate and complete. Therefore Bochumer Verein Verkehrstechnik GmbH can not assume any liability for the topicality, correctness, completeness or quality of the information provided. No liability claims can, for this reason, be brought against Bochumer Verein Verkehrstechnik GmbH for any material or immaterial damage arising from the use or non-use of the information provided or from the use of faulty and incomplete information. A claim is possible only if wilful or gross negligence is demonstrable on the part of Bochumer Verein Verkehrstechnik GmbH. All offers made on these websites are non-binding and subject to alteration. The entire offer, or parts thereof, may be amended, supplemented or erased by Bochumer Verein Verkehrstechnik GmbH without any need for prior notification to this effect. Bochumer Verein Verkehrstechnik GmbH also reserves the right to suspend the publication of this offer temporarily or permanently. These websites may contain direct or indirect links to websites of other providers the contents of which is neither necessarily authorized by Bochumer Verein Verkehrstechnik GmbH nor subject to continuous monitoring. Bochumer Verein Verkehrstechnik GmbH may be held liable only in the event that it has knowledge of such content and that it would be technically and reasonably possible for Bochumer Verein Verkehrstechnik GmbH to prevent its use in case of the content being illegal. 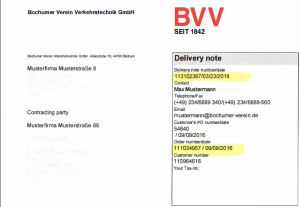 Bochumer Verein Verkehrstechnik GmbH hereby expressly affirms that at the time of linking, no illegal content was recognisable on the linked pages. Bochumer Verein Verkehrstechnik GmbH has no influence on the current and future design, content or authorship of the linked pages. Therefore, they hereby expressly dissociate themselves from all contents of all linked pages that have been changed after the link has been set. This declaration applies to any and all links and references set within our own Internet site and to any and all third-party entries in any guests books, discussion forums and mailing lists which may have been established by Bochumer Verein Verkehrstechnik. Any illegal, incorrect or incomplete contents, and any damage or loss resulting from the use or non-use of such information, is the sole responsibility of the provider of the site to which a link has been made and not the person who merely made the link to the publication in question. This disclaimer is to be regarded as part of the internet offer, from which reference was made to this page. If sections or individual expressions of this statement do not, no longer or do not completely conform to the applicable legal situation, the content and validity of the remaining parts of this document remains unaffected. All brand names and trademarks mentioned within the Internet offer and possibly protected by third parties are subject without restriction to the provisions of the applicable trademark law and the ownership rights of the respective registered owners. The sole mentioning of a trade mark on this web site should not lead to the assumption that it is not protected by the rights of a third party! The copyright for published objects created by Bochum Verein Verkehrstechnik GmbH remains solely with Bochumer Verein Verkehrstechnik GmbH. Reproduction or use of such graphics, sound documents, video sequences and texts in other electronic or printed publications requires the written consent of Bochumer Verein Verkehrstechnik GmbH.